The ultimate solution to tired skin, the best-selling Chanel foundation now instantly revitalizes the complexion upon application — and throughout the day. The formula has been updated with new ingredients to specifically target dry, dull and uneven skin, and moisturizing agents to provide hydration and comfort. A marine extract boosts cell energy to enhance radiance, and light-reflecting pigments smooth away imperfections, creating a soft-focus effect. Creamy and luxuriously lightweight, this essential daily foundation blends effortlessly for perfectly smooth, even-toned, radiant skin. Forget this and move on if you have oily skin. This is a perfect foundation for people with dry/very dry or mature skin. It is beautiful. Very dewy and glowy, offers decent coverage without feeling mask-like and has good staying power throughout the day. MOST AMAZING FOUNDATION EVER DISCOVERED! I AM IN LOVE WITH THIS PRODUCT! I have NEVER found a perfect foundation with an exact match! IT looks as if I don't have anything on my face but pure natural beautiful skin! My face has been so hectic this winter that this just feels so dewy and moisturizing on my face...It feels like I have rich, creamy, silky lotion on! I couldn't stop talking about this and touching my face and my Fiancee really likes it on me and says it looks like I have nothing on and that it was the best thing I ever put on my face. There is NO drug store foundation that can compare...even though the ingredients aren't up my alley I would continue to wear this anyway! FYI: Do NOT purchase if your face is oily!!! 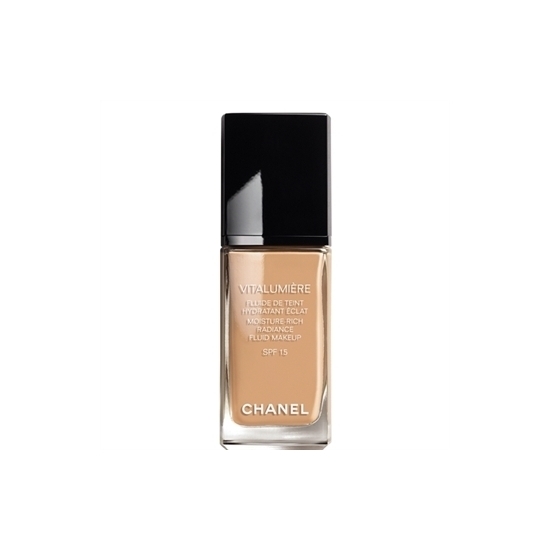 Make sure you tell the Chanel rep to match your foundation to your skin type...HIGHLY recommend for extremely dry skin...maybe normal skin can wear it but if you are oily at all, I wouldn't suggest it! This foundation looks super natural, it has decent coverage and feels light on the skin. It has a satin finish, Good for dry/combination/normal skin. Tends to get oily. A good powder fixes that though. All in all this is an amazing foundation, one of my top ones, next to Pro Lumiere. (Which has just been discontinued). I love this foudation, and the finish is excellent!.. the coverage is just right (chesnut) and it is very much long lasting, hmph it better be for the price!.. but i love it and it was worth every dime! I use this product every day. It gives to my skin a natural look and last almost all day. I found as well the write color for my skin tone! This foundation is amazing. I've never used a foundation where I didn't feel like I needed to follow it up with some blush and bronzer to make it look good. For me, this foundation goes on so perfectly that I don't feel like I need anything more to make my skin look natural and dewy (although I do still use blush/bronzer). It just looks like a perfect version of my bare skin. This is definitely not a foundation for someone with oily skin. But since my skin is dry (and very flakey in the winter), it works very well. It has a gorgeous finish and great coverage. I can't believe how natural looking it is though!! I was using YSL "Touche Eclat" foundation before this. It really is a great foundation, and I thought it was the best one out there... until I tried this one! Definitely worth the $56 I paid for it. I always like to have full coverage and I only need a tiny squirt in order to achieve it, so I think this will definitely last me long enough to not put a dent in my wallet! At first I wasn't willing to pay the expensive amount of €45 for the foundation here in Ireland but when I saw it for €25 in Lanzarote, I couldn't refuse! I wore it the next day. I applied it at 6pm and when I went to take it off at 3.30am it hadn't budged like other foundations I've used. I also only need not one pump but only HALF a pump of the product for it cover my WHOLE FACE! I'm often left disappointed and discouraged when shopping for liquid foundation, but that all changed when I purchased this product. The shade was an exact colour match to my skin tone (very hard for me to do because of my pale skin/yellow undertone combo), it smells wonderful, it blends beautifully, and makes my skin look smooth, fresh, even, and most importantly, natural. I highly recommend this foundation if you have dry skin like me. But if you have normal or oily skin, try the pro lumiere or mat lumiere. Its great!!!! Go buy it! I love this product. It is quiet runny, but easy to blend to match with my skin color. It feels light, and is medium coverage. I absolutely love Chanel foundation.